The Hammer Jack is portable, lightweight, and easy to operate. It comes standard with 100 high-quality FOXPRO sounds, 111 FREE sounds, and has the ability to hold up to 300 sounds. The Hammer Jack features dual-amplified speakers to deliver incredible volume. The front horn speaker handles your coyote vocalizations and common distress sounds with ease, and the rear cone speaker handles the low frequency sounds such as bear growls, owl sounds, and even mountain lion sounds. When combined, they deliver a crisp, clear, high-quality, realistic sound. If you want even more volume, the Hammer Jack allows you to connect two external speakers for incredible volume capabilities. 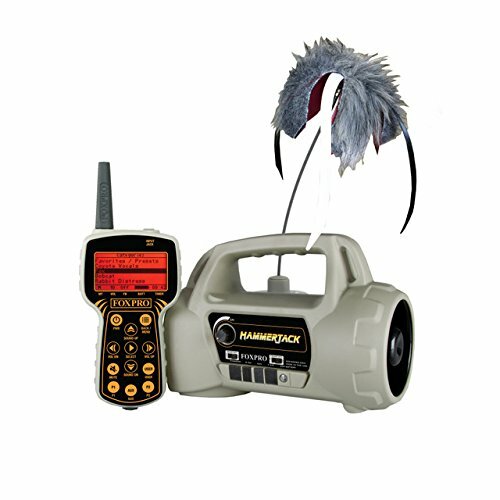 It has a charge jack, auxiliary jack, and includes the Fox Jack 4 with the FOXPRO Fuzzy Wuzzy topper. FOXPRO's Hammer Jack remote is easy to operate and navigation through the sound categories is a breeze. The remote has two preset buttons, a mute button, volume up and down buttons, and much more. All of these features in one amazing, compact, high-quality unit makes the Hammer Jack an incredible value. It's packed with great features and innovations from FOXPRO. The Hammer Jack is backed by a 5 year limited warranty, FOXPRO's unmatched customer support, and is proudly made in the USA!.